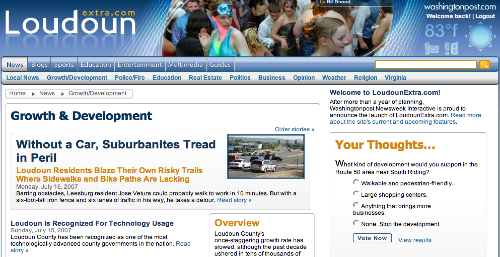 It so happens I live in Loudoun County, and with that context, here’s my first take — LoudounExtra.com isn’t hyperlocal enough. 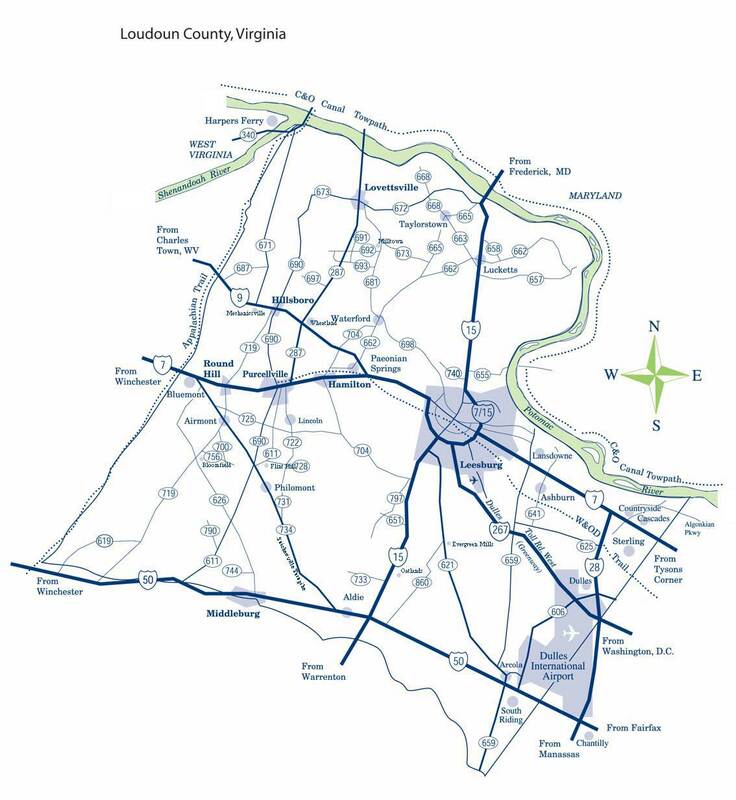 Loudoun County includes extremely diverse areas, including the highly developed zone on Route 7 east of Lessburg, the major city (where I live), and the rural western areas that border on West Virginia. In fact, Eastern vs. Western Loudoun is a major divide on issues of development, schools, transportation, etc. But even within the east of Leesburg corridor, it segments further — down to the level of individual subdivision home owners associations (you can’t escape HOAs around here). News of what is happening in other HOA communities is typically of tangential interest for me at best. Living in LoCo, WashingtonPost.com’s excellent blog about Loudoun County, which is now located on LoudounExtra.com, has done a great job of covering my community, but only when there is big news, not the day-to-day mundane news that is still of interest to residents. LoudounExtra.com does have a nice list of other local blogs, including one dedicated to my community, Lansdowne…Out in the Open. To really go sufficiently hyperlocal, LoudounExtra.com needs to identify EVERY discreet community and determine whether someone is already blogging about the community to include them in their blog network. If not, then LoudounExtra.com should recruit a blogger to write on regular basis about that community, e.g. attend all of the HOA meetings, attend all community events, interview neighbors, etc. My community, Lansdowne, has a Town Center — I’m sure businesses here would be most interested in targeting Lansdowne residents and the handful of communities in easy driving distance, rather than people in western Loudoun, who are probably much less likely to drive here. The blog network would be a perfect way to target those ads to the right level of hyperlocality. Two potentially killer features that LoudounExtra.com seems to have set up nicely and just need to be filled out are the event calendar and the restaurant guide — new restaurants are opening in Loudoun every day, and Loudoun is typically ignored by local restaurant guides, such as in the Washingtonian. I’ll be watching to see if people start adding reviews to the restaurant page. The other element missing from LoudounExtra.com thus far is the key ingredient of hyperlocal, as Jeff Jarvis pointed out — people. I can’t tell whether Washingtonpost.com has implemented the same Pluck social networking and profile features that they have on the main site, but if they haven’t, they absolutely should — giving commenters, reviewers, bloggers, etc. a consistent identity on the system is essential for building the community around people. On restaurant reviews, for example, it will be interesting to see if LoudounExtra.com can compete a site like Yelp, which is laser focused on building a people-driven community around local reviews. Overall, what I like best about LoudounExtra.com is that it exists — the only way to figure out hyperlocal is to experiment, and WashingtonPost.com has wisely committed to the hard work of experimenting. Mark Potts, co-founder of Backfence, has posted an excellent meditation on lessons learned from Backfence, which should be required reading for everyone experimenting with hyperlocal. Hyperlocal content is really mundane. We heard this criticism all the time. You bet it is—if you’re an outsider looking in. To members of the community who actually live with these local issues, it’s vitally important. It’s precisely that mundane content, and the conversations around it, that brings life to hyperlocal sites. I find that when I look at supposedly thriving hyperlocal sites, they seem boring and pedestrian to me. Exception: WestportNow.com. Why? Because I grew up there and know the place and its players. It’s that simple: It’s relevant to me. From outside, hyperlocal content all looks mundane. But it’s information and conversation that’s important to a specific local audience and flat-out unavailable anywhere else—the far end of the Long Tail. That’s not mundane—it’s competitive advantage.